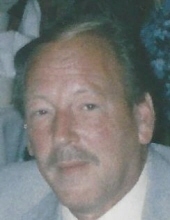 age 66, loving husband of 19 years to Linda (nee Hlavaty); dear brother of Donna McCann (Mark), Marsha Unterzuber (deceased) (Richard), Sharon Edmunds (Jeffrey), Pam Ziegan (David), Gayle Fischbach (Jason) and Scott Ritchie (Bonnie); son of the late Robert E. and Jean L. (nee Dix) Ritchie; son-in-law of Joan (mother Joan) and the late Robert Hlavaty; brother-in-law to Karen Hlavaty (Mike Udivich) and Julie Ferrara (Ron); nephew-in-law to James, Tony and Ron Sedlak; uncle and great-uncle of many. US Army Veteran. Funeral Services in the McGORRAY-HANNA FUNERAL HOME OF WESTLAKE, 25620 Center Ridge Rd. (West of Columbia Rd.) TUESDAY, Nov. 6th at 8 PM. Friends may call at the Funeral Home TUESDAY from 4 – 8 PM. "Email Address" would like to share the life celebration of ROBERT V. "BOB" RITCHIE. Click on the "link" to go to share a favorite memory or leave a condolence message for the family.